Lakeside Swim Club is a huge complex of swimming pools in the Highlands of Louisville. The club draws people like a grocery store or small college, but it does so without car parking lots. How do they do it? Unusually for Louisville, Lakeside has meaningful policies and infrastructure that strongly encourage bicycling and walking. At first, the infrastructure is more noticeable. The club does have two small parking lots, one with space for 50 vehicles. 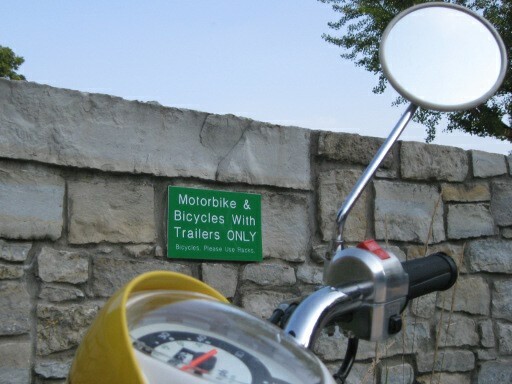 Only you won’t be parking a car there: these parking lots are reserved primarily for bicycles. The racks fill all the way up on busy days. Had they opted to make a conventional Louisville parking lot, they would have only had space for 5 cars. They moved way more people with bike parking. 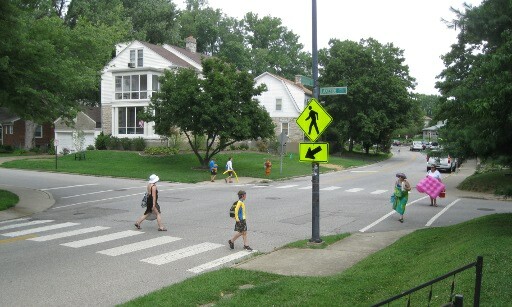 Also on the infrastructure front, they have many conspicuous crosswalks along the bustling suburban road Trevilian Way. These are more like the crosswalks you see on major arterials. The crosswalks are enough to get motorists to hit the brakes on this winding, tree-lined road. Letting your kid walk to the pool without adult supervision is something parents feel good about. On-street parking further slows traffic on Trevilian. Cynics might point out that it is the only thing standing in the way of a bike lane, which would create a more-or-less continuous bicycle facility to the Louisville Zoo, but that would also increase motorized traffic speeds, so I’m unsure if I have my feathers ruffled by this. The on-street parking is very popular, which means you’re not going to “just drive” to the pool, you’re going to “drive and then walk” to the pool. There is also the neighborhood issue of the rather narrow sidewalk, and on only one side of Trevilian Way. The result is not good for side-by-side, but it is still functional for basic transportation, enjoying the gardens along the way. If you’re looking to make things more walking and bicycling friendly, infrastructure is expensive and takes a long time to change. But more important than infrastructure is a policy which encourages walking and bicycling. Lakeside has this in spades. Firstly, is their membership structure. Despite being the best pool in the city, Lakeside tries hard to be a neighborhood community builder. As such, they offer different, cheaper rates to land-owning residents within the neighborhood. By their own policy they have more customers in walking distance than average. Secondly, is the way the club has apparently been grandfathered in through the land development code. You could not just tear out the swimming pool and drop in a Wal-Mart here. Land development code would force you to pave a square foot of parking lot for every square foot of building, and there would not be enough space. As you’d expect for what amounts to a private club, Lakeside’s membership policy does not appear to promote economic or racial diversity. A visit on an average day reveals a sea of overwhelmingly white faces. Rather than fault Lakeside for this, we note that the homogenenity reflects the underlying lack of diversity in Louisville’s neighborhoods, stemming again from regressive choices in our zoning and our land development codes which keep things segregated. However, Lakeside does not offer its reduced rates to renters, which has obvious class segregation implications. 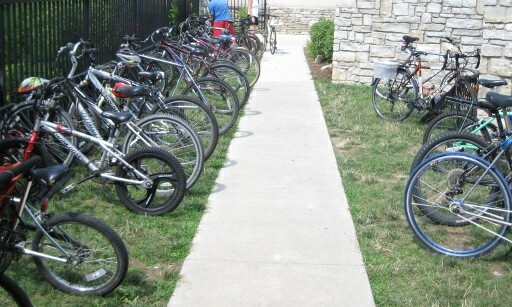 A visit to the front of the pool will confirm that a huge fraction of the Louisvillians at the pool get so by walking or bicycling. These are suburban families, and even unaccompanied children, able to move about their streets freely due to active transportation friendly policy and infrastructure choices. Louisville has a lot to learn from Lakeside Swim Club. Transportation can work without seas of asphalt parking. People adapt. Of course, some still choose to drive. Others car-pool and get dropped off curb-side. Still others take the initiative and choose walking or bicycling. Humans are adaptable, and there’s a lot of room for innovation in the way we’ve been transporting ourselves. Our standard parking requirements have been created to roll out the red carpet for one choice only – the car – at the expense of all the others. Hopefully, with Lakeside as an example, Louisville is starting to offer people more useful choices. Thanks for an interesting post on all that Lakeside does right. I wholly agree. It’s quite an asset to its neighborhood and a unique aspect of the city. However, if you’ll allow me a thought experiment, I can’t help but wonder how the pool might have been a better benefit to the city had it been a public and not a private resource. Imagine Lakeside as the center of a modest city park rather than a private resource for neighborhood residents. The point of comparison I’d like to make in particular is Barton Springs in Austin, Texas, a public spring-fed pool (one of several in that city). That pool is a symbol of the city as a whole, one in which residents are quite protective and proud. When I first moved to Louisville and heard that it had a spring-fed pool, it never occurred to me that it might be private, which was one of my first impressions of Louisville. I understood this as a somewhat negative aspect of the city’s Southern tradition (of course, there are so many positive ones as well). I’m not saying this was necessarily an appropriate association — I’d be interested in getting a better sense of Lakeside’s history — but it was one that other new residents have made as well. The larger question it brings to mind: how might we understand Louisville culture more generally in looking at its public vs. private amenities citywide? Or more generally, how might we understand Louisville’s public vs. private cultures, in a city in which its private institutions (high schools, for instance) are structuring elements of Louisville life? I’m fortunate to live 3 minutes by foot from Lakeside, which is most definitely a community asset of the highest regard. I do want to clarify, however, that those sidewalks are downright dangerous in many places, particularly for strollers or sidewalk-bound bicyclists. It’s always saddened me to know one of the truly unique neighborhood pedestrian amenities in this city can’t even be served by adequate sidewalks, but hopefully it’s just an opportunity for the future. Aside from the fact that bicycle and walking are two inexpensive way of transportation, both are also great exercises that would prevent obesity, thus preventing health complications brought by it. Come to think of it, the city won’t be looking for wrecker sales anymore because bicycles can just be carried home. 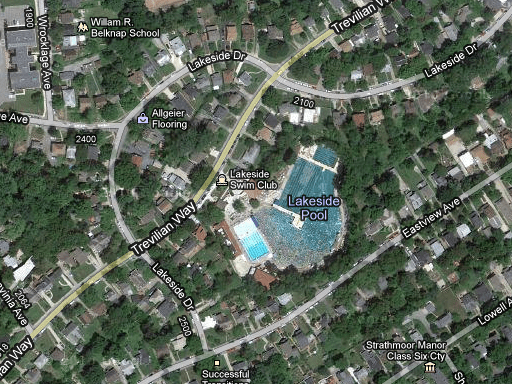 @Kyle Barnett – First, I would like to point out that Lakeside is not a spring-fed pool. It was until the 1950’s, but then the spring was rerouted. It is city water, and regulated as a pool. In regards to the private-v-public issue When Lakeside celebrates anniversaries, they bring out a slew of photos and memorabilia, in addition to those which are hung on the wall. My favorite is some of the advertising, which was selling the development in 1923 as “country living” withing walking distance of the trolley. Lakeside was a designed neighborhood with the Lake as the center, and the lake was, and is, owned by the members. In regards to the policy that does not grant “certificate” membership (what was original called “shareholder” membership until it was changed, presumably for tax purposes) to renters: Lakeside also does not grant “certificate” membership to landlords. The policy is not to discourage renters from membership or to discriminate, but rather to encourage the neighborhood to remain an owner-occupied community. If it wasn’t for this policy, it would be easy to imagine a pool like Lakeside falling into disrepair as the landlords bought the houses up for “use” of the pool, but no longer hand incentive to maintain the pool as a neighborhood amenity. Finally, the costs of maintaining the club are so enormous that it is easy to imagine that if Lakeside had been a public amenity in Louisville, Kentucky, it would no doubt not exist today, much like the streetcar that used to be a short walk up the hill from its residents. Having seen much smaller pools fall into disrepair and close in our community, and continued fights over library funding, and the loss of Otter Creek Park as a community amenity, Lakeside likely owes its existence to its private ownership. 2) forced to compete with another mode that recieved a heavy government subsidy – not exactly working out well. 3) the developers sold all their houses, and didn’t have any reason to reinvest in the system once that was done. The streetcar was always a loss-leader for them, so they could sell houses. Lakeside is an asset to the community and its neighborhood. The clubs efforts to build community are admirable. Now to transportation, the geographic restrictions to club membership make walking/biking more viable. I’m not sure how applicable this is to other sectors of the economy. It must be said that a swim club has a seasonal business cycle that also makes non-vehicular transportation more viable. Yes, I know Lakeside has a gym that is open year round and people in Denmark walk everywhere. Changing habits and culture is difficult. I hate to be a party pooper, but as a Lakeside member, the primary obstacle to the parking lot is a lack of realistic space in which to build a parking lot. Lakeside was built by the developers of the Lakeside subdivision, who wanted to max out their profits obviously and crammed in lots, leaving no undeveloped space (due in large part to the Highlands already being hot real estate by the 1920s when this part was built – there was no space for a country club so they built a pool club). As a member, a common gripe is the lack of parking and I think the club would have built a parking lot if it were cost effective. But it’s just not. Up until the 1970s the club was focused on providing cheap membership fees to promote affordable swimming, and since then land prices and zoning standards simply rule out buying a couple dozen neighboring houses to raze for a parking lot, even as the club has become more willing to spend a lot of money on facilities to retain members. Compare to recreation clubs that had the land to build a parking lot… Audubon Country Club is a good example, drawing its membership traditionally from residents of adjacent Audubon Park. With so much land relative to Lakeside, it was cheap to add a parking lot as members began asking for one, even though so many lived just a few blocks away. Lakeside to its credit does help out people who want to arrive by methods other than cars, the bike racks have been plentiful for decades, long before it was trendy to offer them. But I think that if there was an empty lot next door that they owned or could acquire at a reasonable price and turn into a parking lot, they would do so in a heartbeat. @Bill – Bill, you’ve hit the nail on the head. Parking is important to neighborhoods. It just happens to be less important than every single other thing! Hooray for free markets able to make rational decisions. Would that if you and I went in together on a pool or grocery or big-box store, that we would be allowed to maximize our land value, without having our hands tied by parking regulations that (oops) happen to spoil the neighborhood as a side effect.